JoAnn Corley-Schwarzkopf | NewSchool Management: Can Wearable Tech Transform Your Team? Can Wearable Tech Transform Your Team? 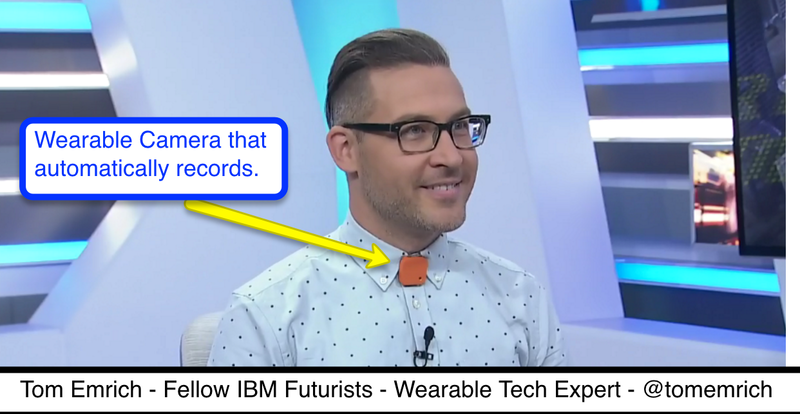 One of the most satisfying professional events I experienced in in recent years was being invited to become a member of the IBM Futurist-Influencer Group representing the human resource-talent management space. This group actively has its ear to the ground exploring new ways to work and more specifically how advances in technology and the use of data will impact the future of work. The entire experience and collegial relationships formed (one with Wearable Tech Expert Tom Emrich from Toronto, seen on the right) has served as a great compliment to the work I do advising and practically helping business leaders align their human resource to process and strategy to increase profits. I've discovered after years of conducting management, leadership and team building workshops for thousands across North America, that the stand alone, one time, classroom event approach was substantially lacking to achieve what my clients need and desire. Our group/stakeholder approach has been wildly successful with substantial ROI numbers built on strong science such as how the brain works, the power of peer groups, and social-emotional intelligence. Now, I'm excited to share additional scientific support. I have to say though, this science is a few years old. In my recent research, I came across a 2012 article in Harvard Business Review entitled The New Science of Building Great Teams (link provided at the end). It describes exciting research on what comprises a great team and equally undermines it. What's also exciting is how the research was conducted, the subsequent data collected from it and the resulting analytics. The article highlights the work of MIT's Human Dynamics Laboratory. Their work is a powerful, groundbreaking intersection of wearable tech, data collection, analytics and the human experience (which comprises something called workplace science utilizing workplace scientists - yep, they exist. Leo Brajkovich at IBM is one. I interviewed him and will be posting that interview in the next few weeks. Subscribe to this blog - box to the right - to be notified when it's posted). So What's the Skinny on Great Teams? Drumroll please...(I hope the answer isn't anticlimactic)...it all comes down to communication. Now, what it took to arrive at that singular answer is fasincating. The effort harnessed the potency of technology and what technology could produce beyond human observation. The resulting data provided unique insights. That's what strategically collected data does -- provides the ability for decision-makers to take a more dimensional view of any aspect of their business. In this case, wearable tech helped identify and measure the communication dynamics and practices within a team and how that impacted a teams' efficiency, productivity and even creative collaboration. Those measurements were also able to reveal the effect to company revenue. The MIT group extracted from the breathtaking data points robust sociometrics (the organized results after the data was analyzed) which identified key elements of communication that impact team performance. 1 > Energy - described as the number and nature of the exchanges among team members. The number of exchanges, valued by type and style of communication reflects level of energy. The more constructive interactions, the more energy. 2 > Engagement - reflects the distribution of energy among team members and energy between each team member. Teams that had clusters, while leaving other members out didn't perform as well. The goal here is to have each team member experience equal high energy with every other team member. 3 > Exploration - this means communication team members engage in outside their immediate team, which could be inside or outside of a company. This gives a strong case for active interdepartmental interaction. This element was particularly significant for creative & innovative thinking and team problem solving. Does The Mode of Communication Matter? Apparently it does! Here's what was discovered -- the most valuable mode of communication was face-to-face. The next -- phone or videoconference, but this mode becomes less effective depending on the number of people participating. In fact, the data is so strong for face-to-face that "35% of the variation in a team's performance" can be determined based on this team interaction mode alone. Guess what - the least valuable form?...email and texting. Special note: When looking at the elements above and considering Energy, we can draw the conclusion that lots of email will not constitute a high energy score. The type of communication (e.g. face-to-face) carries more weight than volume of a lower energy mode. Most surprising is that social time, casual, informal interactions significantly impacted a teams performance, "often accounting for 50% of positive changes in communication patterns." This finding prompted a change in a company's 10 call centers. Now entire teams took their break at the same time. The positive results of this change were so immediate and dramatic, that a forecasted productivity increase of $15 millions a year (collectively) was projected for the group of call centers. No matter the context, call center, innovation team, drug company, senior management team to improve leadership, the resulting data (called sociometrics) was so consistent, a team's success could be predicted just by looking at the numbers, even without meeting the team members. Example: "Just by looking at the sociometric numbers, we've been able to foretell which teams will win a business plan contest." 5. Members periodically break, go exploring outside the team, and bring information back." What Does a Data Badge Look For When Examining Poor Team Communication? Are they trying to contribute but being ignored or cut off? Do they cut others off and not listen thereby discouraging fellow team members from seeking their opinions? Do they communicate only with one other team member? Do they face other people in meetings or tend to hide from the group physically? Do they speak loudly enough? Perhaps the leader of the team is too dominate -- doing most of the talking - not encouraging full participation by all parties. These communication dynamics directly impact energy and engagement. These findings and the technology used to generate them, I believe to be very compelling and a worthy guide to successfully create high performing teams. It offers authoritative proof of what we should expect from each team member and why. 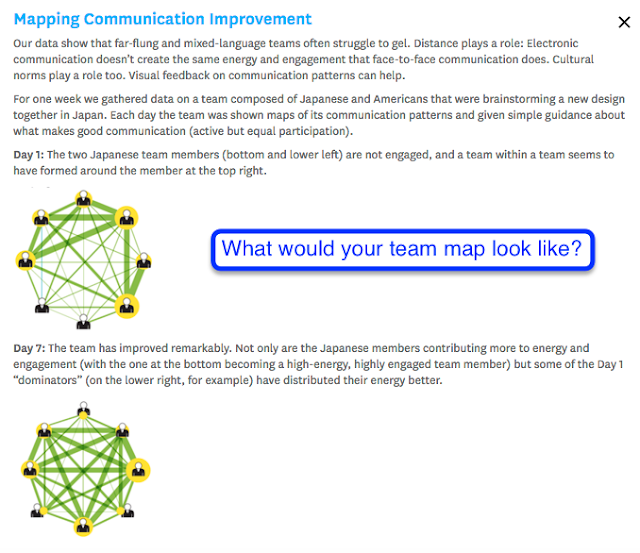 It says what we've been saying for a while, face time matters, the ability to collaborate with every team member matters, teams are as strong as its "weakest link" ... now knowing "link"scientifically means communication connection. It's also refreshing to know that if we want to improve a team's performance we can at least start by examining the most impactful element -- its communication patterns. Is There Such Thing as an "Ideal Team Player"? they listen as much or more than they talk and are very engaged with whomever they're listening to, which is called "energized but focused listening." This wearable tech piece is taking on a life of its own as it helps users learn more about human interaction. Our new way to work will probably be greatly influenced by it's future uses and improved technical capabilities. Imagine the staff of a company wearing them over an extended period of time. What human interaction data could be collected for certain areas of business operations, such as sales, performance reviews, negotiations, cultural alignment, improving global team collaboration to name a few. In the end, data and the technology used to produce it can provide powerful insights to enhance and confirm our human experience (confirm e.g. - everyone in the tribe communicates and contributes for the survival of the group -- no new news here. The industrial revolution just numbed our tribal sensibilities and memories). Technology and data are invaluable collaborators as we work to achieve our human best in every aspect of our collective experience.